It's a great way to contribute to our community. Every year, we will perform thousands of hours of volunteer service to help keep the Yolo community safe and healthy. As a Master Food Preserver, you get to meet and work with a group of passionate, Yolo-area food enthusiasts. The program is rigorous: There are six classes with hands-on labs to learn the food preservation techniques, and outside study in addition to class time. Weekly written tests and a final examination prepare the trainees to begin their first year. 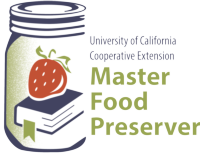 Interested in becoming a UCCE Master Food Preserver volunteer in Yolo County? Enter your contact information on our Master Food Preserver Training Interest form and we will contact you about our next training.